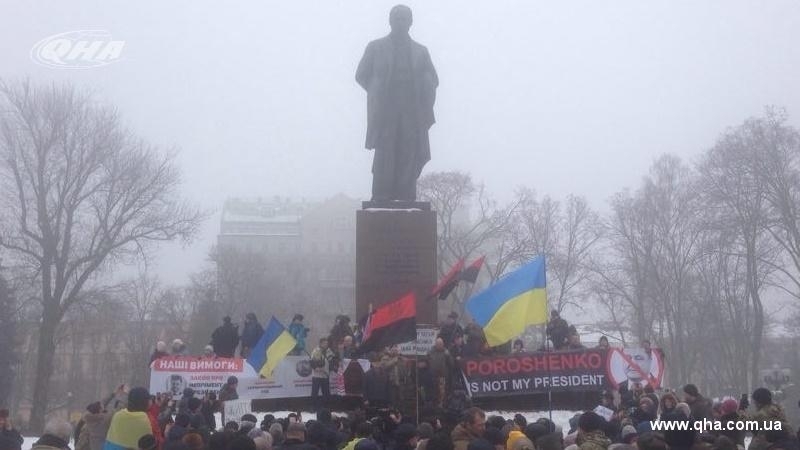 In Kyiv, in the park of Shevchenko, where the ceremony of laying flowers to the prominent Ukrainian poet Taras Shevchenko is to take place with the participation of officials, including President Petro Poroshenko, about 200 people gathered to protest against the actions of the authorities, QHA correspondent reported. The police cordoned off the territory of Shevchenko Park and installed metal frames on all approaches to it. Among the people who wait for the president and officials there are several groups of people, including many military personnel from the ATO, as well as representatives of veteran organizations. Participants in the protest action demand the adoption of the law on the impeachment of the president, the law on the Anti-Corruption Court, a new law on elections and the resignation of the Prosecutor General of Ukraine Yuriy Lutsenko. “Many came with flowers. Shevchenko's verses are cited from the rostrum,” the QHA correspondent informed. Reportedly, near the monument sappers are engaged in searching for explosives. In parallel with the meeting, traditionally flowers were laid in honor of Taras Shevchenko's birthday. According to a QHA correspondent, nationalists from the stage are voicing anti-Semitic statements.